Celebrate Labor Day and make summer last just a little bit longer. The weather’s getting cooler, Fourth of July is long over, and the days are getting lazier. Back-to-school ads are everywhere, much to the annoyance of schoolkids. And now Labor Day is upon us, marking the saddest time of year: the end of summer. Don’t fret. We’ve compiled 20 fantastic movies to celebrate the season, each one available for streaming this weekend to make your summer just a bit longer. Lay in a plentiful supply of popcorn and your favorite frosty beverages and enjoy! Grown daughters Setsuko Hara (left) and Yoko Tsukasa worry about their irresponsible father in Yasujiro Ozu's The End of Summer. Arguably the greatest of all Japanese filmmakers, Yasujiro Ozu (1903-1963), worked again and again with the same actors and the same co-writer, used the same style (low angles, straight-ahead, back-and-forth shots during conversations, very little moving camera), and even the same text-over-burlap opening titles. Ozu's penultimate film and one of his few shot in color, The End of Summer (1961) is like a mini-vacation, a little sad, but relaxing. It tells the story of a widowed old man Manbei (Ganjiro Nakamura) whose sake brewery is in financial trouble. His grown children worry about him as he acts childishly, even sneaking off to spend time with his old mistress. It's a lovingly bittersweet tale with bursts of great joy mixed with sadness. Ozu handles the inevitable confrontation between the mistress and the children not with soap-opera bluntness, but with grace and intelligence. His filmmaking style seems to have embraced the difficulties of life; rather than raging against them, his films impart a sublime sense of peace. 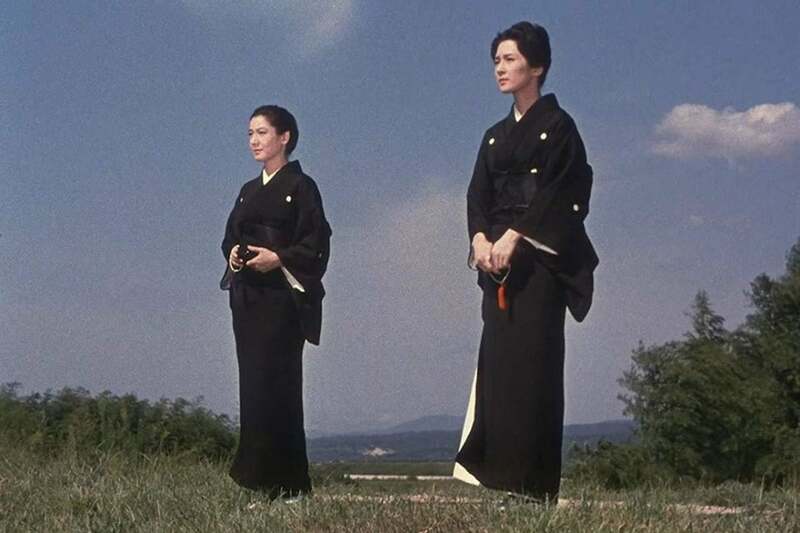 Michiyo Aratama and Yoko Tsukasa and the great Setsuko Hara play Manbei's daughters. In Japanese with English subtitles. Blake Jenner (left) and Glen Powell are college ballplayers having a ball in Everybody Wants Some!! Set in the final days of the summer of 1980, just before school starts, this ensemble comedy, about a college baseball team living together in a raucous frat house, unfolds in the spirit of National Lampoon's Animal House, Meatballs, and Wet Hot American Summer (see below). Blake Jenner plays the freshman who must be introduced and inducted into all the crazy antics, and Glen Powell plays the spiritual leader, charmingly verbose and occasionally smoking a pipe. The group goes to a country bar, a punk rock club, and a party thrown by theater nerds; they drink great quantities of beer, pick up girls, and occasionally practice some baseball. Unlike the meatheads in a deliberately dumb comedy, these guys are a great combination of wise and naïve, sowing their wild oats but also laying the groundwork for an effective, bonded ball team. As with the film's spiritual predecessor, Dazed and Confused (1993), Everybody Wants Some!! (2016) is virtually plotless, though Linklater's observant, thoughtful camera makes every scene fascinating and hilarious. It revels in time and place, like a time-traveler sitting back and enjoying everything, and, even after 116 minutes, you don't want it to end. Marie Rivière has summer vacation troubles in Eric Rohmer's The Green Ray. Eric's Rohmer's Le Rayon Vert, or The Green Ray (1986), is another bittersweet summer vacation movie, a last chance at some fun before the fall starts. The insecure Delphine (Marie Rivière) finds herself stuck when her traveling companion cancels on her. She makes several other attempts at a vacation, but finds she doesn't fit in anywhere. Rohmer's films are dialog-heavy, but the dialog is used to follow characters as they try to unpack their most baffling and indecipherable feelings. Delphine might have been something of an annoying whiner in lesser hands, but Rohmer makes true attempts to understand her. The title comes from comes from Jules Verne and describes a very rarely seen phenomenon: the final beam of light from the setting sun, said to have certain powers. The film is the fifth of Rohmer's six-film "Comedies and Proverbs" series; clueless distributors also gave it the title Summer, which is not to be confused with Rohmer's 1996 A Summer's Tale (Kanopy, FilmStruck), which was part of his "Tales of the Four Seasons" series. In French with English subtitles. 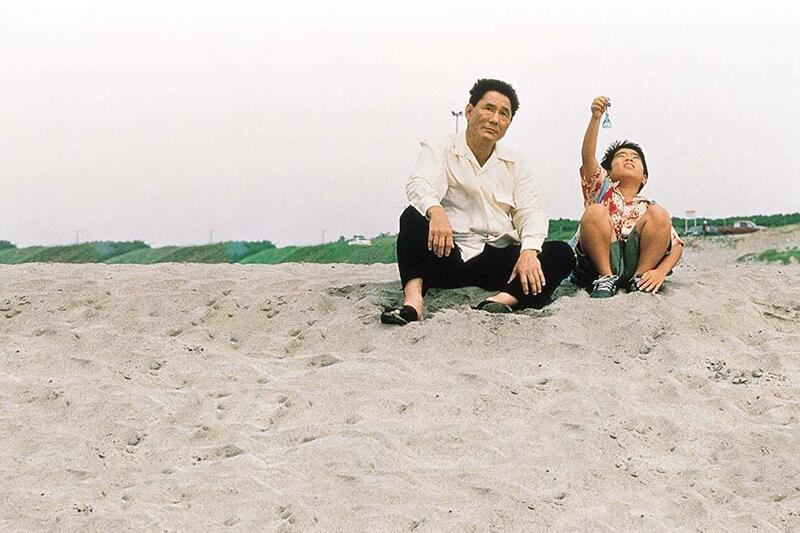 Takeshi Kitano (left) takes a reluctant summer road trip with Yusuke Sekiguchi in Kikujiro. The multi-talented Takeshi Kitano, who has worked as a comedian and television host in addition to writing, directing, and acting in films, is best known for his violent, action-oriented films full of gangsters or samurai. Anyone familiar with his work will be surprised by the sweet, funny Kikujiro (1999), a summertime road movie that pairs the stoic, granite-faced star with a young boy. Acting under his stage name "Beat" Takeshi, he plays the title character. The boy, Masao (Yusuke Sekiguchi), is a neighbor who wishes to travel to find his mother; Kikujiro's wife makes him go with the boy. At first, the grumpy fellow doesn't much care about getting to their destination, but eventually he and the boy become friends in a very touching and funny way. Kitano's style is slow-burn, with lengthy, static shots that suddenly and shockingly change, often to comic effect. (The film's chapter headings are also very funny.) The pair meet some colorful characters on the road, including a poet and a pair of bikers, and no one seems to be in much of a hurry. Composer Joe Hisaishi's beautiful score, and its now-familiar "Summer" theme, contribute to the movie's relaxing vibe. In Japanese with English subtitles. (L to R) Nick Robinson, Moises Arias, Gabriel Basso run away from home to build a house in the woods in The Kings of Summer. The coming-of-age story is a tricky business in Hollywood, mainly because the people who make them can only recall seeing other coming-of-age stories, rather than actually coming-of-age themselves. Happily, The Kings of Summer (2013) has a unique vibe and feels bracingly fresh. Best pals Joe (Nick Robinson) and Patrick (Gabriel Basso) have become fed up with their parents: Joe's cynical dad (Nick Offerman) and Patrick's strange, cheery mom and dad (Megan Mullally and Marc Evan Jackson). So they decide to run away into the woods, build their own house, and live like kings. The very strange, philosophical Biaggio (Moises Arias) joins them. Director Jordan Vogt-Roberts, a veteran of "Funny or Die," and first-time writer Chris Galletta cook up an appealing blend of characters learning lessons, experiencing setbacks, fighting, and falling in love with girls, without ever going stale. The adult characters are a tad flat, but funny enough that they work; the Biaggio character shouldn't work, but does. For a generation of kids, this is going to be a classic they'll revisit every so often, but if you've ever been a high school freshman, you'll like it too. Gianni Di Gregorio (right) prepares a feast for Maria Cali and some other neighborhood ladies in Mid-August Lunch. Gianni Di Gregorio (one of the co-writers on the acclaimed Gomorrah) wrote, directed and stars in Mid-August Lunch (2008), a unique recipe, a bittersweet comedy/drama, with a dash of realism. Di Gregorio plays the middle-aged Gianni, who lives in Rome with his aged mother; when the August holidays roll around, Gianni can't afford to go anywhere, and neither can he leave his mother by herself. Gianni finds others that are in the same boat, and eventually he finds himself palling around with four old ladies. He decides to cook them all a big meal for the August 15 Ferragosto holiday, trying to accommodate everyone's dietary needs and trying to make everyone happy. Gianni spends a good deal of time sampling tastes at the local wine shop and swilling glasses while he cooks (a delicious-looking macaroni casserole). Refreshingly, the movie never goes overboard into slapstick or pathos, nor are the old ladies ever made into cutie-pies. Everything just is, and the story merely consists of things that happen. When one of the ladies gets a phone call telling her it's time to come home, her face registers hurt. It's a movie you don't want to leave. Gian Enrico Bianchi provides the outstanding cinematography, both hot and gritty. In Italian with English subtitles. Björn Bjelfvenstam and Ulla Jacobsson attend an event-filled summer weekend in Ingmar Bergman's Smiles of a Summer Night. If you associate the name Ingmar Bergman with dreary, artsy, soul-searching cinema, you need to feast your eyes on this delightful summertime comedy. Smiles of a Summer Night (1955) is a kind of buoyant, agile roundelay, with a group of characters gathering for a weekend getaway at a summer house, where several of them wind up swapping lovers. None of the characters are bad, or ridiculous, and nothing is weighted too far to one side. It's meticulously balanced, especially between the use of dialog sequences and striking visuals. One powerful sequence involves two lovers running away in the night, done largely without dialog. Bergman intuitively, sympathetically depicts other characters' involvement as they either help or gaze upon the departing lovers with disappointment and longing. For its age, it's a remarkably ripe, sensuous movie. It was later turned into the Stephen Sondheim musical, A Little Night Music. Die-hard fans can stream it with two other Bergman "summer" movies: Summer Interlude (1951) [Kanopy, FilmStruck] and Summer with Monika (1953) [FilmStruck]. In Swedish with English subtitles. 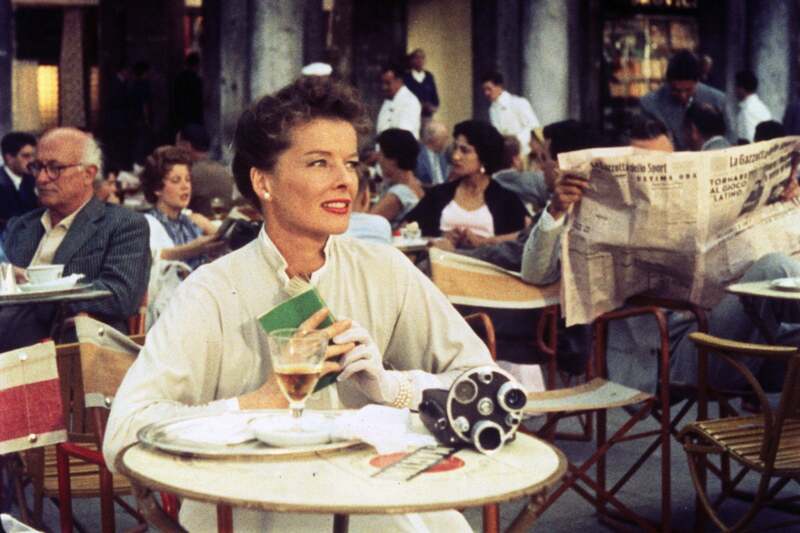 Katharine Hepburn tries to enjoy her dream vacation to Venice, Italy in David Lean's Summertime. Director David Lean was in-between his intimate, black-and-white movies (Brief Encounter) and his massive, Oscar-friendly epics (The Bridge on the River Kwai) when he made the touching, bittersweet drama Summertime (1955), a small story told on a wide canvas. Katharine Hepburn plays Jane Hudson, a lonely American spinster on the wrong side of 40 who takes a trip to Venice, Italy after saving up for most of her life. She doesn't quite fit in, either with the complaining, ugly Americans she meets, or with the locals, so she takes to exploring and making home movies. She discovers the simultaneously beautiful and realistic parts of the city, before she's swept off her feet by the dashing Renato de Rossi (Rossano Brazzi). She's in a state of romantic bliss, until she learns that he's married. A street urchin, Mauro (Gaetano Autiero), provides some comic relief, while Lean steers the movie toward an unconventional ending. It's a tender, touching movie for die-hard romantics. It was based on a play by Arthur Laurents, but feels fully cinematic. Liam James meets AnnaSophia Robb during his coming-of-age summer in The Way Way Back. Another coming-of-age story that transcends the genre, The Way Way Back (2013)—named for the place that kids used to ride in old station wagons—is both hilarious and touching, digging just a little deeper than usual. Teen Duncan (Liam James) is forced to go on a summer holiday to Cape Cod with his mother (Toni Collette), her condescending boyfriend Trent (Steve Carell), and Trent's unpleasant daughter (Zoe Levin). Dismayed by the drinking and cheating of the adults around him, he goes exploring and discovers the Water Wizz theme park. There, he meets the cocky, irresponsible, but likable Owen (Sam Rockwell), who takes Duncan under his wing. Rockwell is hilarious, turning in one of those intoxicatingly carefree performances a la Bill Murray, but grounded in something real. Like the best coming-of-age movies, this one is rooted in pain and uncertainty, which makes the good stuff all the sweeter. It was co-written and co-directed by a pair of actors: Nat Faxon and Jim Rash. Paul Rudd and Zak Orth try to have as much fun as possible on the last day of camp in Wet Hot American Summer. A multi-character ensemble, Wet Hot American Summer (2001) was intended as a spoof of summer camp comedies like Meatballs. But despite not-particularly stellar reviews or box office, it went on to become a cult classic, thanks to cheerfully dumb dialog and also to the fact that nearly everyone in it soon became a star. Basically, on the last day of summer camp, 1981, a bunch of camp counselors try to sleep with one another and occasionally help some struggling young campers. Amy Poehler and Bradley Cooper play the nerdy theater teachers, Molly Shannon can't help talking about her divorce in front of the kids, Paul Rudd plays a dumb hunk whose many sexual conquests never last more than an afternoon, Elizabeth Banks plays one of his conquests, Ken Marino pretends to be a stud but is really still a virgin, and head counselor Janeane Garofalo nurses a crush on scientist David Hyde Pierce. Michael Showalter has two roles, as a sci-fi nerd and (in age makeup) as terrible comedian Alan Shemper. Fifteen years later, Netflix launched a TV series, a prequel, set on the first day of camp the same summer, as well as a second series, set 10 years later.